The 1727 catalogue of Dr Williams’s Library contains several works by the Huguenot pastor, Pierre du Moulin. Some are written in Latin and a larger number in French. There are also items translated into English for those who were unable to read French. As a child du Moulin was forced to flee with his family to Sedan which was then a place of safety for Protestants. Later he spent time in Leiden, England and Paris, where he was pastor of the protestant church at Charenton, before having to return to Sedan when his life was in danger once more. There he died at the age of ninety having failed to recover from the effects of falling from his horse. Several of du Moulin’s works held by DWL were printed by Pierre Aubert in Geneva. These consist of single items such as Bouclier da la Foi (Buckler of Faith) 1630 and volumes which contain several works bound together. The documents printed by Aubert usually have images on their title pages which sometimes reflect the subjects of the works. 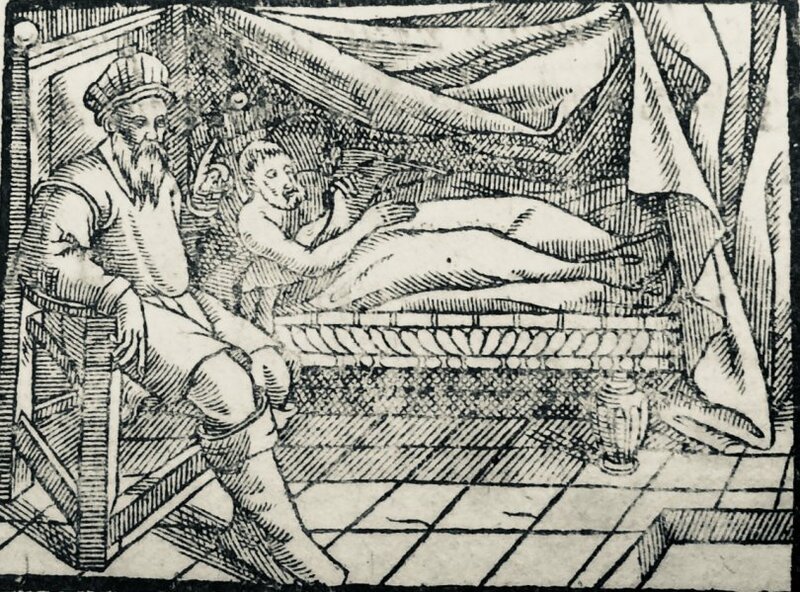 Familiere Instruction pour Consoler les Malades (Informal Instruction for Consoling the Sick) 1636 has a picture of one man lying in bed and another sitting beside him. Other titles such as Traitté de la Conoissance de Dieu (Treatise on the Knowledge of God) 1637 with its basket of fruit have less obvious connexions with their illustrations. Aubert also uses other images which include a garden, a shipwreck, shepherds and a castle on top of an island with a ship at sea near it. Unfortunately it has not yet been possible to find much information about Aubert himself. In addition to the works printed in Geneva the collection includes items by Pierre du Moulin in French printed in Sedan, Paris and Amsterdam. The English translations are often by his son, Peter or Pierre the Younger, and usually printed in London.